On Sunday, the first Lifegarten Play Time at Siteworks in Brunswick took place. Lifegarten is one of Vast Experiences’ projects aiming to connect humans through play. It’s a kindergarten for a adults, where kidults can explore human connection and gather new perspective while playing in a judgement-free environment. 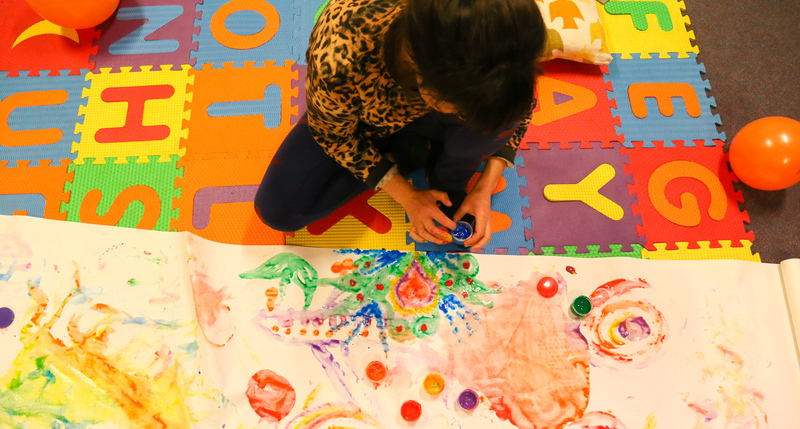 During Sunday’s Play Time session we played improv make believe games and created art works doing finger painting, drawing and crafts. It was amazing to see how everyone re-connected with their inner child. The next Lifegarten Play Time will be on June 17th at Siteworks. You can get your ticket here: https://lifegarten.eventbrite.com.au Check out Lifegarten.com for more information. Last night I went to Beekeeper talks, an initiative by Koky Saly to inspire people to turn their ideas into reality. I listened some amazing talks by four different social enterprises. Koky finished his talk with a question his sister asks him before she passed away: If you die tomorrow, would you be happy with the sum of your existence? This question really resonated with me. Let’s spend the finite amount of time we have doing things we actually care about. The world is like an ever-changing set of toy building blocks with 7.5 billion pieces and there are 7.5 billion ways to look at it. We are the pieces. Sometimes it feels that we can’t connect with others. This is only because we are defining us by the way we view the world. Deep down we are all made of the same material, just like the plastic block pieces. If we open ourselves, we realise that there are 7.5 billion pieces with valid views of the world. This is the basis of understanding others. To be understood is something all pieces desire. If we feel understood, our position or role in this giant set seems a little more validated. Once we are understood, we can connect with others. Once we connected, we have created something unique and share a similar view. We then realise that we all were somewhat connected all along. I’m originally from Germany. When I was 16, I went on a high school exchange to America. Looking back, this exchange tremendously changed my way of seeing the world. I gained so much new perspective. I often ask myself what would the world look like, if everyone was going to a different country for a year. I think it would be a much friendlier place. I’m an engineer by trade. Often when I got stuck in solving a problems, it was a slight shift in perspective that allowed to solve the problem from a different angle or even better turn it into an opportunity. Being able I have a wide range of views at your disposal allows you to think outside of the box. I realised that a lot of the projects I’m running and things I’m doing, either enabled me to gain new perspectives or inspired others to do so. Within Vast Experiences I am exploring concepts to gain more perspective and open yourself up to new experiences.